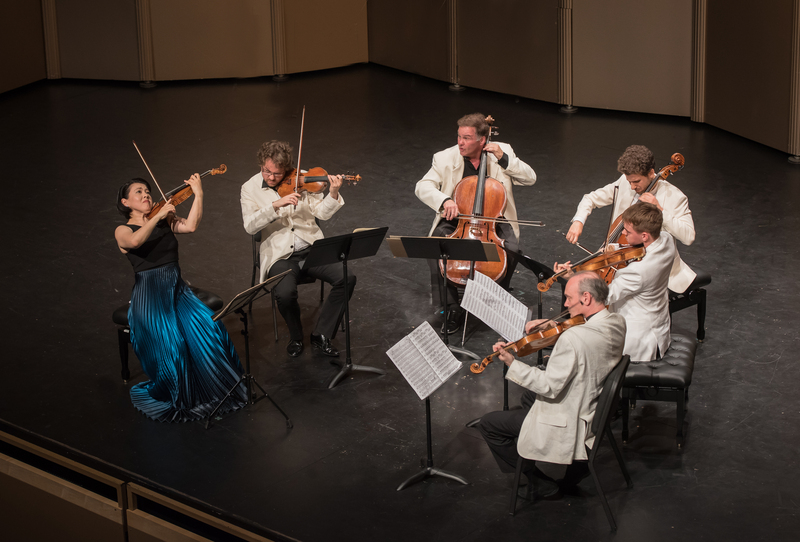 For years, I have wished I could be in Menlo Park in person to see the superb chamber music offerings of Music@Menlo. I am familiar with their annual box set of CDs, recorded live and compiled at the end of each season. Finally, it happened, and I was able to take in the final concert last night of the series’ 14th season entitled Russian Reflections. Music lovers flocked into the Center for the Performing Arts at Menlo-Atherton, a modernist, intimate hall seating 500, one of three venues used by the Northern California series. It had excellent acoustics for chamber music. 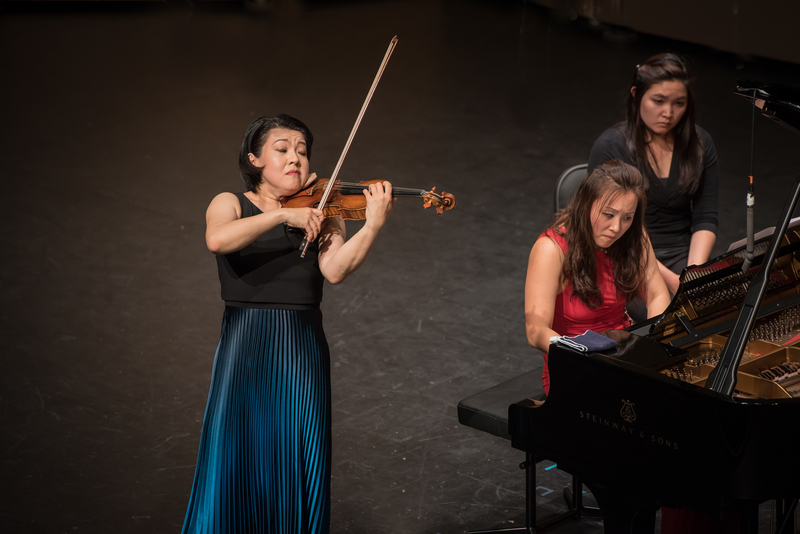 The pianist Wu Han, who is co-artistic director with the cellist David Finckel, announced that the three-week, Russian-focused season had presented 31 free events and 18 paid. Most of it was sold out. 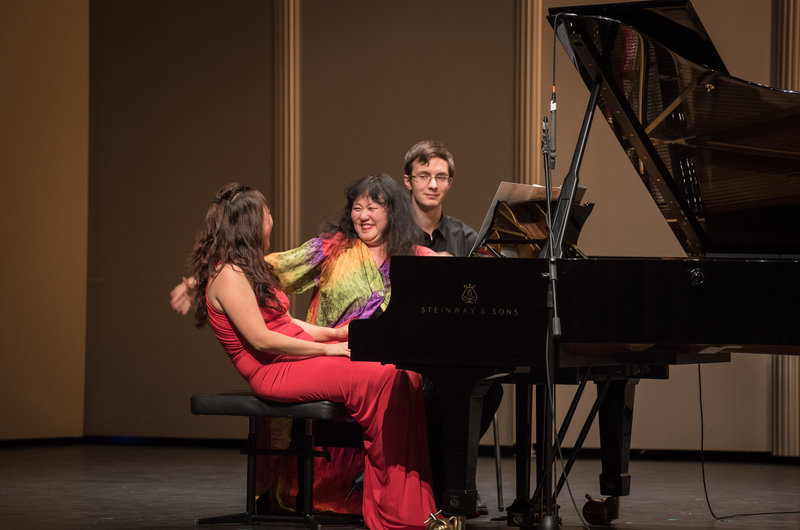 The season also featured lectures, master classes and an institute for young virtuosos. One of those, who also performed in a public concert, was Cincinnati’s Coleman Itzkoff, a rising cellist. During Saturday’s concert, the ‘kids’ cheered some of their teachers from the back of the hall. The program centered on Russian-inflected “souvenirs” — by Shostakovich, Tchaikovsky and Barber. An air of nostalgia pervaded the concert, particularly in a lovely set of Spanish Songs by Shostakovich, sung by a terrific young Russian baritone named Nikolay Borchev to sensitive accompaniment by Hyeyeon Park. But there was no better example of “fun” than in the opening selection for piano, four hands, Samuel Barber’s “Souvenirs for Piano,” Op. 28, written in 1952. Wu Qian took the first part; Wu Han the second, for an engaging performance of the suite of six dance miniatures. The opening Viennese-style Waltz was brilliant, showy, and reminded me of Rachmaninoff. There was a melancholy “Pas de deux” and a wonderful “Hesitation Tango.” I especially loved the final Galop, which seemed a direct descendant of Milhaud and Poulenc, with its polytonal touches and enchanting melodies. The duo performed in perfect synch, even when hands crossed into each other. I’m running right out to buy the music. And what a treat it was to hear the wonderful violinist Kyoko Takezawa as soloist in Tchaikovsky’s “Souvenir d’un lieu cher,” which she performed by heart. The opening “Meditation” was deeply interior, and the violinist’s phrasing was romantic and beautifully shaped. The second movement, a brilliant scherzo, offered a chance to display the soloist’s technical finesse. Its lyrical center was enchanting, and Takezawa approached each phrase with nuance. The pianist was an excellent partner, and their fireworks were played in perfect tandem. 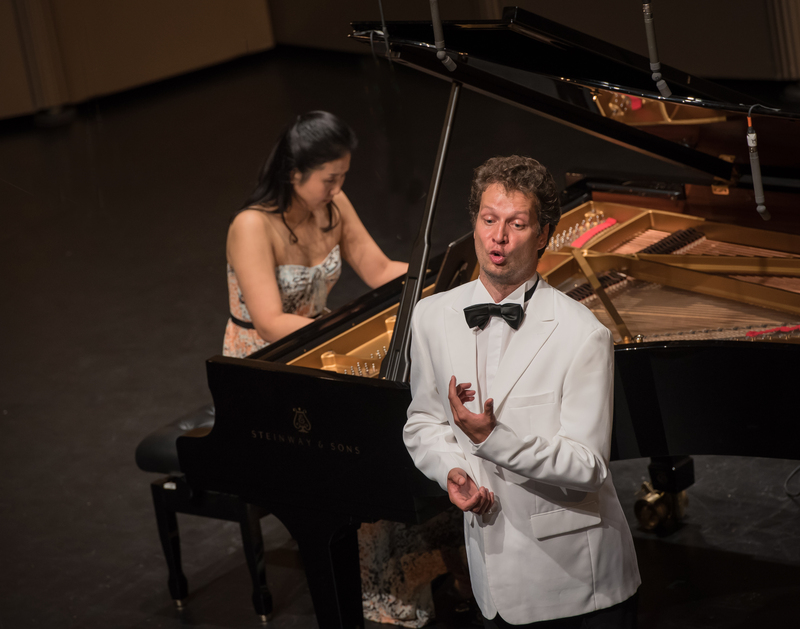 Nikolay Borchev and pianist Hyeyeon Park. The Shostakovich songs that followed were a real discovery, as was the fresh-voiced baritone Borchev. Of his set, the first song, “Farewell, Granada,” seemed the most authentically Spanish, with improvisatory melismas for the singer that reminded one of Flamenco singing. My favorite was “Black-eyed Maiden,” a love song, delivered with charm and humor. The pianist, Park, offered the evening’s only Silicon Valley moment, using an iPad for her score. This is a ravishing piece, and it was given a galvanizing performance, from its robust opening movement, to the electrifying finale, an intense, Gypsy-like dance, all played with split-second precision. It was one of the most exciting performances I’ve ever heard, and listeners were on their feet in an instant. Music@Menlo has a presence during the winter season, and will announce the 15th season later this year. For more, visit musicatmenlo.org.